Sakai Community DocumentationSakai 19 User Guide (English) RubricsHow do I add a rubric to a gradebook item? Add or Edit a Gradebook item. Select Add Gradebook Item to create a new item. Or, select the down-arrow in the column heading for an existing gradebook item, and then select Edit Item Details. Note: If the gradebook item is locked, it is coming from another tool. You will not be able to use a rubric with locked items, since they must be graded from within the tool of origin. Select Save Changes when you have finished setting up the gradebook item. Your gradebook item now has a rubric attached. Gradebook items with rubrics attached will display a rubric icon next to the title of the item. Prev: How do I add a rubric to an assessment (i.e. test or quiz)? 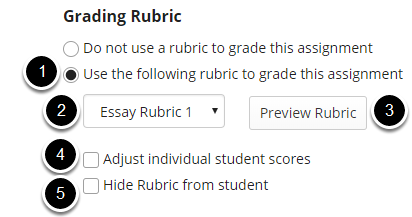 Next: How do I grade an assignment using a rubric?